Go back to Who Is St. Andrew? 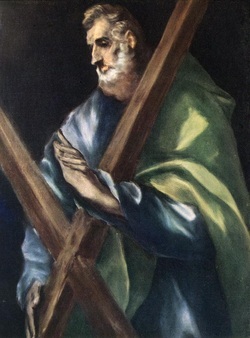 Most references to Andrew in the New Testament simply include him on a list of the Twelve Apostles, or group him with his brother, Simon Peter. But he appears acting as an individual three times in the Gospel of John. When a number of Greeks (perhaps simply Greek-speaking Jews) wish to speak with Jesus, they approach Philip, who tells Andrew, and the two of them tell Jesus (Jn 12:20-22). (It may be relevant here that both "Philip" and "Andrew" are Greek names.) Before Jesus feeds the Five Thousand, it is Andrew who says, "Here is a lad with five barley loaves and two fish." (Jn 6:8f) And the first two disciples whom John reports as attaching themselves to Jesus (Jn 1:35-42) are Andrew and another disciple (whom John does not name, but who is commonly supposed to be John himself -- John never mentions himself by name, a widespread literary convention). Having met Jesus, Andrew then finds his brother Simon and brings him to Jesus. Thus, on each occasion when he is mentioned as an individual, it is because he is instrumental in bringing others to meet the Saviour. In the Episcopal Church, the Fellowship of Saint Andrew is devoted to encouraging personal evangelism, and the bringing of one's friends and colleagues to a knowledge of the Gospel of Christ. 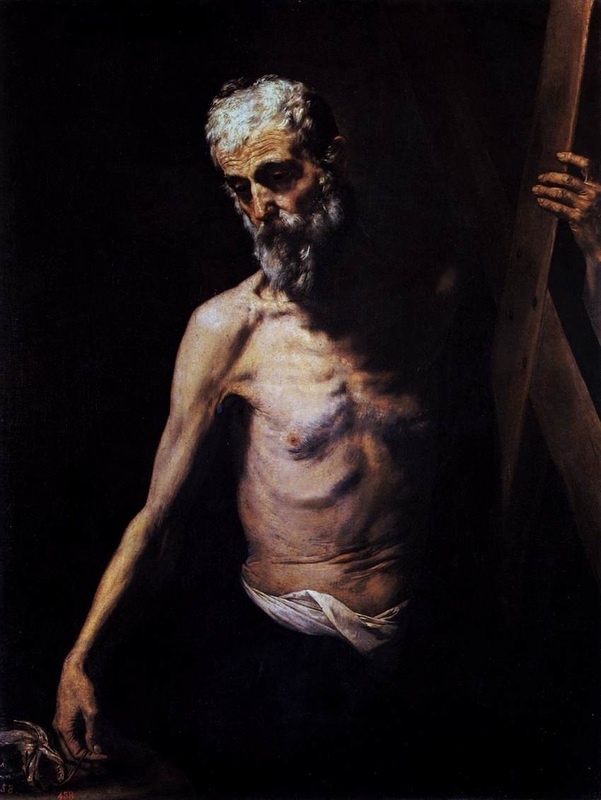 Just as Andrew was the first of the Apostles, so his feast is taken in the West to be the beginning of the Church Year. (Eastern Christians begin their Church Year on 1 September.) The First Sunday of Advent is defined to be the Sunday on or nearest his feast (although it could equivalently be defined as the fourth Sunday before Christmas Day). Andrew is the national saint of Scotland. George (23 Apr) is the national saint of England, Patrick (17 Mar) of Ireland, and Dewi = David (1 Mar) of Wales. George, who was a soldier, is customarily pictured as a knight with a shield that bears a red cross on a white background. This design is therefore the national flag of England. It is said that Andrew was crucified on a Cross Saltire -- an 'X' -shaped cross. His symbol is a Cross Saltire, white on a blue background. This is accordingly the national flag of Scotland. A symbol of Patrick is a red cross saltire on a white background. The crosses of George and Andrew were combined to form the Union Jack, or flag of Great Britain, and later the cross of Patrick was added to form the present Union Jack. Wales does not appear as such (sorry!). Whether there is a design known as the cross of David, I have no idea.